Creates an OpenGL canvas (drawing area for OpenGL). It inherits from IupCanvas. The IupGLCanvasOpen function must be called after a IupOpen, so that the control can be used. The "iupgl.h" file must also be included in the source code. The program must be linked to the controls library (iupgl), and with the OpenGL library. To make the control available in Lua use require"iupluagl" or manually call the initialization function in C, iupgllua_open, after calling iuplua_open. When manually calling the function the iupluagl.h file must also be included in the source code and the program must be linked to the lua control library (iupluagl). To link with the OpenGL libraries in Windows add: opengl32.lib. In UNIX add before the X-Windows libraries: -LGL. The Lua binding does not include OpenGL functions. 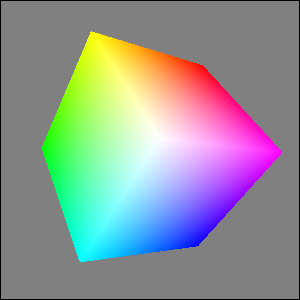 But you can use any OpenGL binding available, for example the LuaGL binding. action: Name of the action generated when the canvas needs to be redrawn. It can be NULL. The IupGLCanvas element handle all attributes defined for a conventional canvas, see IupCanvas. Apart from these attributes, IupGLCanvas handle specific attributes used to define the kind of buffer to be instanced. Such attributes are all creation only attributes and must be set before the element is mapped on the native system. After the mapping, specifying these special attributes has no effect. ACCUM_RED_SIZE, ACCUM_GREEN_SIZE, ACCUM_BLUE_SIZE and ACCUM_ALPHA_SIZE: Indicate the number of bits for representing the color components in the accumulation buffer. Value 0 means the accumulation buffer is not necessary. Default is 0. ALPHA_SIZE: Indicates the number of bits for representing each colors alpha component (valid only for RGBA and for hardware that store the alpha component). Default is "0". BUFFER: Indicates if the buffer will be single "SINGLE" or double "DOUBLE". Default is "SINGLE". BUFFER_SIZE: Indicates the number of bits for representing the color indices (valid only for INDEX). The system default is 8 (256-color palette). COLOR: Indicates the color model to be adopted: "INDEX" or "RGBA". Default is "RGBA". COLORMAP (read-only): Returns "Colormap" in UNIX and "HPALETTE" in Win32, if COLOR=INDEX. CONTEXT (read-only): Returns "GLXContext" in UNIX and "HGLRC" in Win32. DEPTH_SIZE: Indicates the number of bits for representing the z coordinate in the z-buffer. Value 0 means the z-buffer is not necessary. ERROR (read-only): If an error is found during IupMap and IupGLMakeCurrent, returns a string containing a description of the error in English. See notes bellow. RED_SIZE, GREEN_SIZE and BLUE_SIZE: Indicate the number of bits for representing each color component (valid only for RGBA). The system default is usually 8 for each component (True Color support). STENCIL_SIZE: Indicates the number of bits in the stencil buffer. Value 0 means the stencil buffer is not necessary. Default is 0. STEREO: Creates a stereo GL canvas (special glasses are required to visualize it correctly). Possible values: "YES" or "NO". Default: "NO". When this flag is set to Yes but the OpenGL driver does not support it, the map will be successful and STEREO will be set to NO and ERROR will not be set (since 3.9). SHAREDCONTEXT: name of another IupGLCanvas that will share its display lists and textures. That canvas must be mapped before this canvas. VISUAL (read-only): Returns "XVisualInfo*" in UNIX and "HDC" in Win32. The IupGLCanvas element understands all callbacks defined for a conventional canvas, see IupCanvas. ih: identifier of the element that activated the event. These are auxiliary functions based on the WGL and XGL extensions. Check the respective documentations for more information. ERROR attribute will be set to "Failed to set new current context." if the call failed. It will reset ERROR to NULL if successful. Activates the given canvas as the current OpenGL context. All subsequent OpenGL commands are directed to such canvas. The first call will set the global attributes GL_VERSION, GL_VENDOR and GL_RENDERER (since 3.16). Returns a non zero value if the given canvas is the current OpenGL context. Makes the BACK buffer visible. This function is necessary when a double buffer is used. Defines a color in the color palette. This function is necessary when INDEX color is used. In Windows XP, if the COMPOSITE attribute is enabled then the hardware acceleration will be disabled. The IupGLCanvas works with the GTK base driver in Windows and in UNIX (X-Windows). Not available in our SunOS510x86 pre-compiled binaries just because we were not able to compile OpenGL code in our installation.